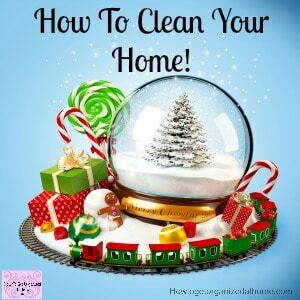 While I love decorating for the holidays, I just don’t like the thought of adding to my cleaning! It is possible to have Christmas decorations without more cleaning! There is a secret behind this, it is to do the decorating slowly! It might seem an odd way to decorate for the holidays but it is less stressful and a lot less messy! I have enough to deal with already, I really don’t want to add more to the mix as this is just asking for a disaster to happen! 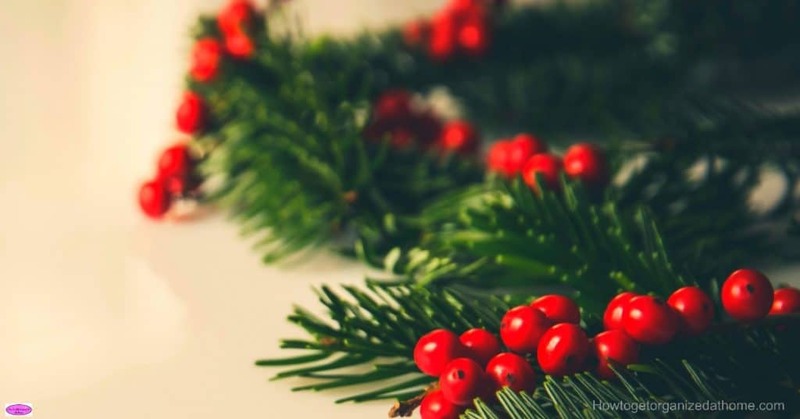 Have you ever noticed that when you decide to get out the Christmas decorations there just seems so much mess and even more clutter when you have finished? You don’t need to do this, it is possible to have a less stressful time decorating and more fun along the way! You really don’t need to do the Christmas tree, the lights on the house and get out all the little Christmas decorations out in one go! Take your time and tackle one area at a time, even spread it out over multiple weekends. This allows you to not get stressed and it is more enjoyable as you are not rushing to get everything out and placed. This certainly causes too much mess and chaos! 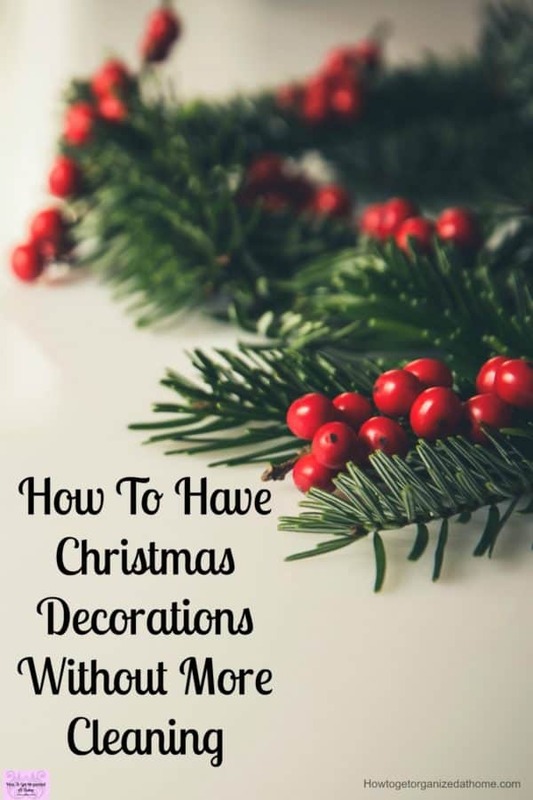 Have a list of the decorations that you want out and where you intend to put them! This is a great way to ensure that you are getting only the things that you love and want, out in your home! You don’t need to have every item that you have ever bought for Christmas out every year! Sometimes tastes change and items just mightn’t be right, you don’t necessarily have to get rid of the item if it has sentimental value, so long as you have space to store the items correctly. Before putting out Christmas toys, you know the ones that sing and dance or just have pretty lights, make sure they are working and the batteries haven’t leaked whilst in storage. I always remove batteries before putting items away as sometimes batteries can get damaged and leak and this can cause damage to the item. You don’t have to fill every inch of your home with decorations and different objects. The more items that you put out the more you will need to clean! My rule is for every item we put out I put an item away for the holiday period, this means I am not cleaning any more items during the holiday period; this is great for time management and my sanity too! If you are putting lights up on your home, remember the electric costs of your home will rise too! If you are sticking to a budget, this increase needs adding into your monthly spending on electrical costs. You don’t need to compete with anyone else, have as many lights as you feel comfortable with. They are a great way to lighten up your home on dark winter nights, they can add to your security if you have them on sensors too! This time of the year can get hectic, parties, presents and Christmas jumpers all form part of this crazy time of year. Adding to this with decorating our homes, we add so much more to our lives and if you struggle with organization it can quickly become a nightmare! On top of all that you have to think about how to organize your Christmas decorations, this is more than enough to drive a person insane! Ask for help from other family members to keep you on track with all the tasks that need doing. If parties require items and transport, it is only fair if they can help out with some of the tasks around the home. Write things down, you just need a list of all the items on it with a date and person responsible. As tasks complete the item’s checked off. It is that simple! It is possible to decorate without adding to your cleaning schedule! By taking your time and spreading out your decoration process, it makes the season a more enjoyable experience for all! Decorate your tree and make it simple and easy! By splitting up your decorating you will reduce the cleaning that happens after each session and you will enjoy the process so much more in the long-run. Therefore, it is possible to put up your Christmas decorations without adding more cleaning time to your busy lives. Put away some items, this reduces the amount you need to clean, it also gives you time to assess the item and decide if you really need it or if it is time to find a new home! Cleaning as you go, in short bursts of time, makes it much more enjoyable and you are making memories too!